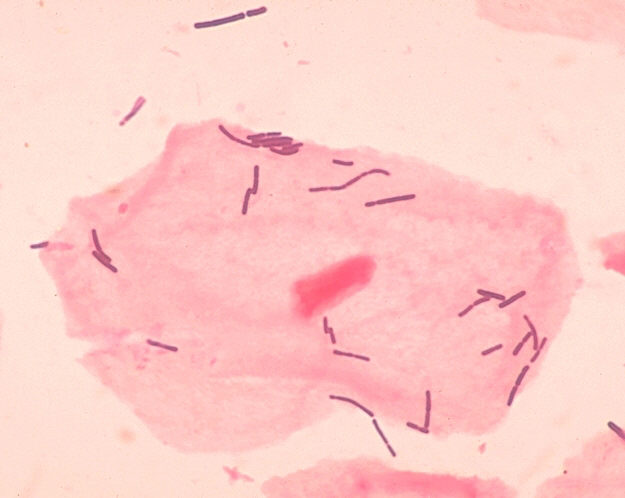 English: Lactobacillus organisms and vaginal squamous epithelial cell. Bacteria appeared as gram-positive rods among squamous epithelial cells and neutrophils in this vaginal smear. This media comes from the Centers for Disease Control and Prevention's Public Health Image Library (PHIL), with identification number #1048. Note: Not all PHIL images are public domain; be sure to check copyright status and credit authors and content providers. actual 15:51, 18 març 2006 625 × 498 (257 Ko) Rasbak Picture from English Wikipedia '''''Lactobacillus''''' bacteria and a vaginal squamous epithelial cell. Obtained from the CDC [http://phil.cdc.gov/phil/home.asp Public Health Image Library]. Image credit: CDC/Dr. Mike Miller (PHIL #1048), 1982.